We are fortunate enough to have a fantastic old hawthorn tree in our garden which we think dates back to before the house being built when the land belonged to the local “big house” and it was probably grazed by sheep. We also have a mixed hedge around part of out boundary which is predominantly hawthorn which I have tried to layer in parts to make it thicker at the base and more dog proof. 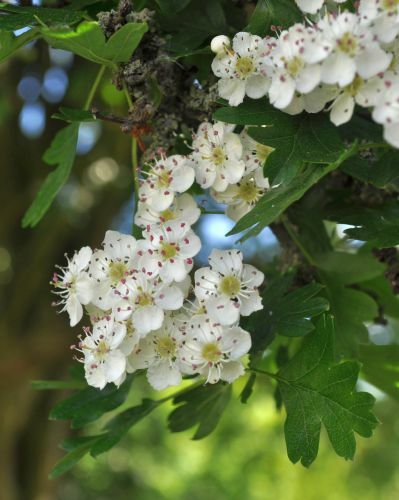 Hawthorn has a fantastic blossom, often called May because of when it blossoms, which insects love. In spring our tree often sound as if it is alive with all the buzzing! Over the last few years it has blossomed earlier every year so that it has been in blossom in early to mid April. This year (2013) it only just managed to be in full flower for the last few days of May! Besides the huge amount of insect life that the tree supports, it is also very popular with the birds who come to feed on the insects and, in the autumn, the berries.